I have always loved Hero Arts Flowers! The new release includes so many beautiful flowers. I am loving the Antique Rose Stem woodblock stamp. What is it with a good woodblock stamp? Not many companies making these anymore and they are still my favourites. 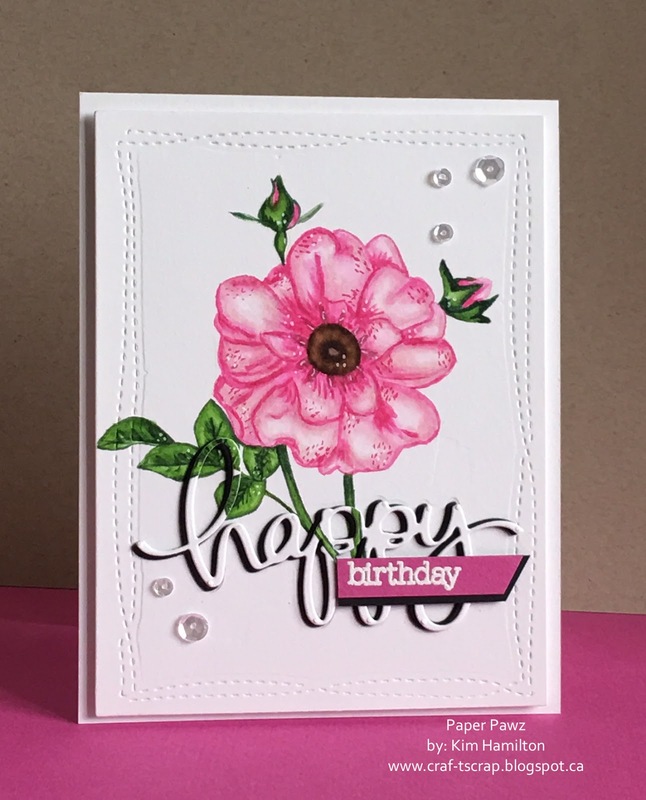 This card is for a special friends birthday and I am submitting it to the current Hero Arts Challenge - Fabulous Flowers. Hero Arts Antique Rose Stem - I stamped it with Antique Linen Distress Ink making it a faint outline on Stratford Bristol Paper so that I could use my Zig Clean Color Brush Pens. I have always struggled with watercolour and I have purchased almost every watercolour product out there! When I first tried the Zig pens I completely fell in love especially when used with Bristol Paper. For the flower I used 028, 200 and 202, once I began the faint Antique Linen Distress slowly disappeared making it possible for me to create my own flower centre which at first stressed me out lol! But I like the way it turned out. For the leaves I used 041, 044 and 048 (Greens). I used my water brush to smooth everything out. I then used the Happy (Mama Elephant) and die cut the original panel and four others in black cardstock to make the white pop. The Birthday sentiment which I white embossed is from Hero Arts It's Your Day. PPP sequins and some white dots with my gell pen to finish it off!